When I started out writing a plot function for the spline fit, the termplot() function failed for univariate models this is fixed now. So the main incentive to use plotHR() is gone. On the other side there is a lot of customization possible with plotHR() which is not with termplot() and one my find the syntax interesting to see how the internals of the coxph() function work. I learned at least a lot from writing this. before using the function. Note the forward slash “/” in the path description in R – using the Windows backslash “\” will fail. You might also find it useful to open the downloaded file plotHR_0.x.R and have a look inside. I am trying to keep the code as readable as possible and to comment extensively. Feel free to send feedback, bug reports, improvements and of course to adapt it to your needs. in the R-command line without brackets and R will display the syntax of the function. Note: I have rewritten the function several times since I wrote the initial post. V0.11: The density plot of the explanatory variable at the bottom of the panel is rewritten by Max Gordon. He rewrote big parts of the function and added the possibility to plot different models/ subgroup analysis into the same plotting panel right from the function. V0.11 is basically a downscaled fork of his latest version. I am considering to add the full version as V0.12 but I have to get through the code first in order to adapt the “Usage” part. V0.9: Mainly rewrite of the density plot. rug = “density” will produce acceptable density plots on the x-axis with marks for 2.5-, 25-, 50-, 75- and 97.5-percentiles. Also the confidence shade is marked at the same percentiles. This will only appear when rug = “density” is specified. 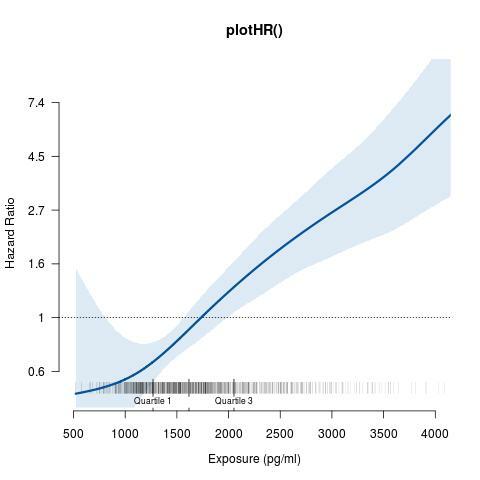 The position of the density plot in the main plot panel is still a concern: It should work for one-panel plots. In multi panel plots the density plot will move under the x-axis. This can be manually adjusted by selecting a fitting value for dens.pos to move it up again. For a 1×3-panel I had to use dens.pos = 0.6. V0.7 is a complete rewrite. The local dataset is trimmed to include only model covariates and complete observations only. The incomplete observations are omitted in the cox model anyway. This removes difficulties which arose from missing covariate values in the dataset. x.log option is deprecated – it is planned to use the xlog option from plot.default() on the long run. the rug option is extended to FALSE, “density” or “ticks” (the default). The option rug = “density” is still a bit alpha’ish but includes a density plot of the covariate distribution on the x-axis. V0.6 – removed the y.log option, since the scale should be logarithmic anyway. Later I will also rewrite the x.log option, since the feature is already incorporated in the plot.default() function. I also removed the dotted line at HR=1 level, since some complained about it overstating the importance of the log(HR) intercept. I included it, since it gives a hint about the significance of the smooth term, in case the confidence intervals cross over the line… Those who miss it can add manually lines( h = 0 , type = 2 )I rewrote the “rugs” option. Try rugs = "density" It is still “beta”ish, but some like it. V0.4 – the y-scale should be logarithmic; a HR of 0.5 (50% reduced Hazard) should show the same distance from HR = 1 as a doubled Hazard (HR = 2); this is now default. The linear scale I used initially is biased in this concern. The option y.log allows both ways (linear and log-scale); the axis labels denote Hazard Ratio instead of log(HR). Therneau TM, Grambsch PM: Modeling Survival Data: Extending the Cox Model. Springer 2000. The relevant part is on page 108ff, chapter 4, Modeling the functional form of covariates. Therneau is the maintainer of the “survival” package in R. I wonder why the additive modeling of a covariate is not mentioned more explicitly in “library(survival)”. Thanks very much for writing this. How do you connect the x and y axes a the origin? If you want the axis without the space, you have to change the function code. Then you could not use the rug/density plot on the x-axis, since they are sitting in the space which the x-axis is moved downwards…..
I’ve been using these plots and loving them. I am however facing a problem in getting low values (.09) to show up on the axes. Any ideas? in order to plot on a HR-scale from 0.09 to 2. What I’ve done is to add the possibility of plotting mutliple models in the same plot. As I’ve posted previously I’m struggling with the finding out how to do time dependent coefficients in R and right now I’m chopping up the time and plotting the graphs on top of each-other. It’s not a dream solution but it does the job OK.
you get a cross through the waist. I guess it’s not so strange but now I’m a little confused how the regular coxph() does this without a reference. After all cph() should only be a wrapper around coxph(). I’ve also changed the density polygon so that it doesn’t need a second plot but is created in the main canvas – this way you don’t need the dens.pos – the density is always positioned at the x-axis. Another thing I changed was the ability to add exp() to the spline in case someone prefers that format on the yscale. Thanks a lot Max! I got no notification from WordPress about your ongoing comment activity, so that all your activity went completely unnoticed. I will dig into your code as soon as possible. Great that you left a download link! Hi, I got the exact same error with you when I run this function plotHR(). Have you fixed it later on and what is the problem? Thanks! Great R package. But what I’d like to do is use it with interactions where one constitutive element of the interaction is a spline. PC3_BC and BEGINbc are continuous variables? I am not sure what you mean by “constitutive element” (English is not my native language and I did not encounter this terminology before)? Are your refering to a continuous effect modifier for the covariate PC3_BC? If so it might be that the continuous interaction is also not linear, so you would end up with a spline on a two-dimensional space. As far as I know the pspline() in the survival package is very basic. I know that you can do this with Wood’s mgcv package. Here you can do logistic regression and have non-linear interactions visualized as a smoothing surface over two interacting variables and plot the surface with vis.gam(). Thanks. BEGINbc is a binary variable, POLCONIII is continuous. I’m able to plot the effect using gam package, but was hoping there was a way to do it directly from cox model. Thanks for your beautiful plot, and I wanna draw a plot like this one. so there is an interaction between continuous variable "blood" and categorical variable "dis" (1 or 0, it means disease). coef3 is constant after fitting the cox model, it means the effect of blood is exp(coef3) times among ppl with dis compared to ppl without dis. as blood is continues, how can I make a plot with x-axis as blood value, y-axis is the hazard ratio : exp(coef3*blood value) using your code? You would not need to plot it. The plot is only interesting if you are out for non(log)linear effects of the covariate. In your case blood is linear and disease is categorical and also the interaction is categorical. If you plot this you get two linear graphs with different slope and the quotient of the slopes is coef3. This way you can get an idea about what is going on, but you get no test about the significane of the interaction term. Hello , thanks for your reply. My data set is counting process data. the ” blood” is time dependent variable which changes every week for each patients during the follow up period, why you said it is linear variable? I am quite new in R, in my interaction model, the interaction of time dependent variable ” blood” and “dis” is significant, If I plot the interaction, maybe I will get two curve( not linear graph) for dis 1 and dis 0, and the ratio of two points in two curves (when at same blood value,i.e same x-axis value) is constant of exp(coef3), right? Thanks a lot, I am happy to discuss this with you. I have a dataset with 2 treatments and want to assess the effect of a continous covariate on the Hazard ratio between treatment A and B. Is this something that plotHR can do simply? I get the point, but never did it myself. You want a smoothed interaction term, which is very reasonable. I have never seen anything like it. I would not exclude the possibility, that it is possible in coxph(). This is more a question of modelling. When the pspline(continuous)*dochotmous comes up with something meaningful, then it might be possible to plot it. Try the r-help email list and look for comments from the heavyweights in the field, Therneau and Woods I would think. If you look at ?termplot in R you will see, that termplot() as the default plotting function for such estimates simply ignores the interation term and might give an error. plotHR() as it is right now also ignores interaction terms. … when thinking about it: As you pose your question my first answer is valid, but as a workaround in the direction of your thinking one can plot a smooth for the continuous covariate in subgroups of Treatment = “A” and Treatment = “B”. This is not the same, since you do not get HR of A vs B dependent on Cov but you might get an idea what is going on.